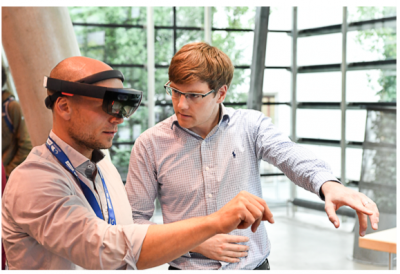 We hope to show the benefits of using new devices, such as Microsoft HoloLens, in patients' rehabilitation. 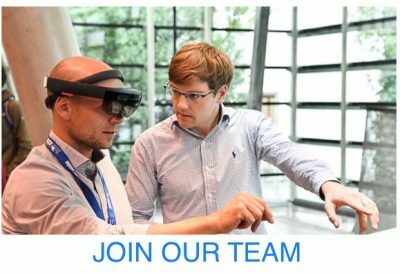 We see the augmented reality as a part of the rehabilitation of the future. Using technology allows patients to perform rehabilitation exercises at home. The therapist can evaluate patient's performance based on the data measured during the rehabilitations session. We believe innovations and technology in rehabilitation have a potential to empower the patients and at the same time relieve the financial burden on the health-care system. 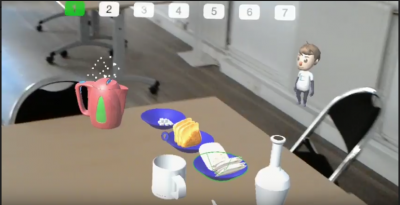 Simple games to get the user familiar with the HoloLens device and to try an interaction with the application. Focused on learning the user to use his gaze, head orientation, gestures and clicker. With tagging game the user can tag important elements in his home, using QR codes. Later when he needs these items to complete an activity of daily living the application can help him to find them. Real ADL support games aim to help the user to complete activities of daily living such as tea making. The application guides the user step by step. Please be aware that this app is a demo version for a research project that was funded by the EIT Health. In its current version, the presented features demonstrates only basic functionalities of the whole idea. For this version, we do not claim or guarantee any positive impact on users’ health. This version is NOT intended for any commercial use.